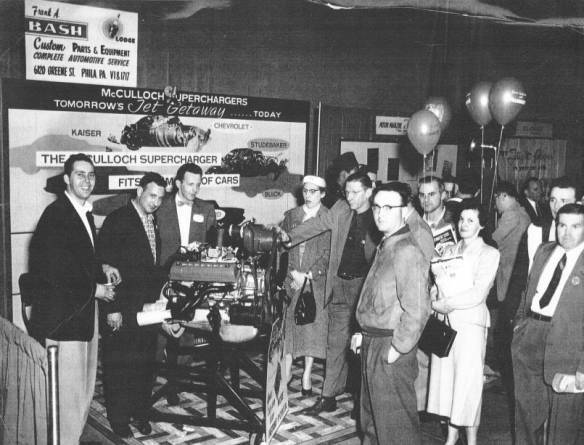 This site is dedicated to the McCulloch VS57 Superchargers produced during the 1950’s. I’ve created it due to the lack of information readily available on these remarkable devices, and hopefully it will turn into a reference area for those of you who have, or are thinking about installing a McCulloch on your auto. The site is under gradual development and is initially concerned exclusively with the VS57 Superchargers. I hope to extend the site to cover VS57 variants, the 1930’s McCulloch Superchargers, and the VR57 Superchargers once I have achieved sufficient coverage of the VS57. This is assuming I can find out enough about these Superchargers to be able to give them adequate coverage. Your help with this would be appreciated, please see Help me! for more information. I anticipate that the site will be updated weekly, but it is quite a slow process researching and re working material to display, so the weekly updates will probably only involve a couple of pages or so. So please have patience if I haven’t yet covered the areas that you are particularly interested in. Thanks for the good response to the site, and the support I have been given. NOTE: Please press your refresh button often for this page, otherwise you might miss updates. I'm missing a few McCulloch Tips from the Motor Trend magazine - is anyone able to scan these and e-mail them to me?. Actually I'm desperately running out of new information, particularly with regards to the D0-VS59 and VR supercharger variants. I'm also desperaterately lacking in McCulloch installation literature for non-Ford applications, i.e. Chevrolet, Oldsmobile, Buick etc., any help with this would be very much appreciated. Also I'm after Carter AFB and WCFB modification information for blow through applications. I'm collating serial numbers for the VS57, VR57 and DO-VS59 or DO-59 units. This is basically to give me a better feel for the number of superchargers manufactured, the number of variants made (such as VS57C, VS57H, VR58C, etc.,) as well as to help document the supercharger history. 06 Oct 2005 - Apologies for a long absence - Family and work have come first alas -Updates - New picture on rods and rails page of 1957 Lincoln 368 in a 1924 Ford. Minor typo correction to the history, and VR57 cutaway pictures added to the VR57 front page. Thinking about a restructure/rework of the site - any suggestions? I do not claim to be a guru on McCulloch Superchargers, and cannot be held responsible for the accuracy of the information on this site. If you have any corrections, or additions, to the information presented on this site then please contact me. The author Jim Moody does not assume any liability for any direct or indirect damage, injury, loss of property or life due to use or misuse of comments, suggestions, procedures, modifications, enhancements or repairs discussed on the discussion pages, or on any of the site pages. Jim Moody also assumes no liability for any of the opinions expressed on the discussion pages. All materials on the McCulloch Supercharger Site are submitted by myself, readers of the site or are found on the Internet and are assumed not to be copyrighted. If any materials found on the Site are of a copyrighted nature, please contact me and they will be removed immediately.